Enhance architectural and landscape décor with inviting seating, the sleek Espresso Backless Benches from the Skyline Series. 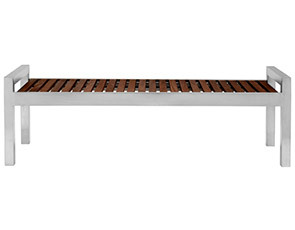 Inventively styled 5' backless benches feature a seat constructed utilizing natural 1-1/2" wood espresso slats, supported by a simple yet precision formed frame. Combining a non-corrosive stainless steel frame with a seat design that is resistant to moisture, splintering and warping, the attractive Skyline Series Espresso Backless Benches is offer long lasting performance in virtually any setting. 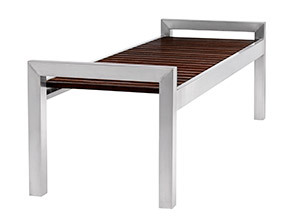 Portable bench allows for placement in a variety of settings or secure the bench to a concrete surface—anchor bolts included.